With two young girls in the house, there is always an abundance of hair accessories. Keeping them organized and within quick reach has sometimes been a struggle. 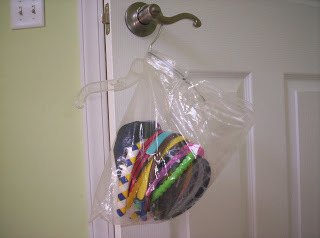 I keep little ponytail holders and barrettes separated in small clear storage bags in a plastic bin under the bathroom sink, but needed something different for larger pieces. 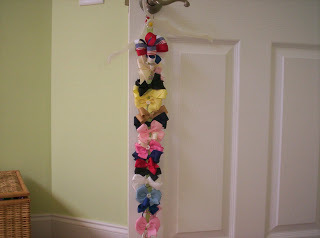 I really like this hairbow holder that a friend gave us some time ago. It is just a nice piece of ribbon with a hoop at the top and a small porcelain square at the bottom that has my older daughter’s initial on it. The bows are easily attached and removed. I hung the ribbon from a small coat hanger and put it in the girls closet. At some point I realized that I needed a plan for all of the hairbands they have. I took a gallon-size Ziploc storage bag, poked a hole in one side near the top and put a small coat hanger through the hole. This also hangs in their closet next to the hair bows. It’s not the most attractive storage, but at least they are all collected in one place and, because it’s see-through, we can quickly spot the hairband to match the outfit they’re wearing. Keeping hair accessories organized and easy to find works for me! Find more tips at Works for Me Wednesday at We Are THAT Family. Great idea! It's easy to see because the bag is clear and the height is just right.